(CN) – A team of engineers developed a first-of-its-kind silent, lightweight plane that flies without any moving parts like propellers or fans. Engineers from the Massachusetts Institute of Technology power the plane with a silent “ionic wind” produced above and below the plane. They published their findings Wednesday in the journal Nature. In the short term, the project has implications to develop quieter drones. 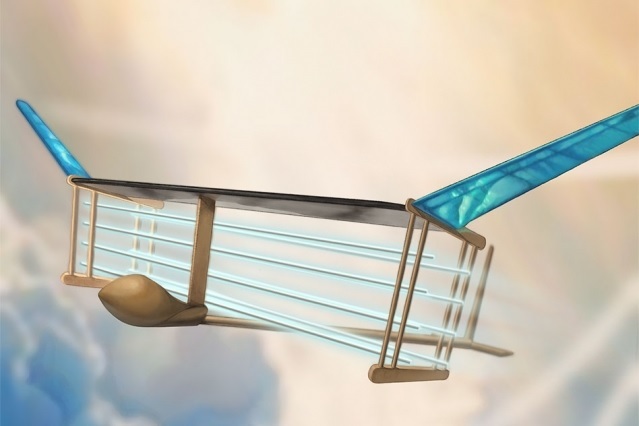 In the longer term, the plane could lead to the production of fuel-efficient passenger planes. The technology was partially inspired by “Star Trek,” said MIT aeronautics and astronautics professor Steven Barrett. In particular, the TV series’ spacecrafts that flew through space without moving parts, exhaust or noise. The plane works using a principle called electroaerodynamic, or ionic wind. If the right amount of voltage is applied when a current passes between a thin and thick electrode, the air between produces thrust – a wind. Hobbyists have used the ionic wind principle, which was first discovered in the 1920s, to design objects that hover in the air for a short amount of time. While it took years to develop, Barrett says he worked out how the technology could be used to propel a plane for a sustained flight. “Now the possibilities for this kind of propulsion system are viable,” he said. The plane weighs about 5 pounds and has a wingspan of about 16 ½ feet. Previously, scientists were not able to propel anything that weighed more than a few grams. The team flew the plane 10 times in an MIT gymnasium, for a distance of almost 200 feet. Scientists in the field of fluid mechanics expressed optimism about the new technology and the possibilities of flying drones with ionic wind. “[Outside of drone applications], it is difficult to infer how much it could influence aircraft propulsion in the future,” said Franck Plouraboue from the Institute of Fluid Mechanics in Toulouse, France.